At the end of the day you want to relax and have somewhere comfortable to rest your head, a good meal, a warm bath and maybe a cold ale, although not necessarily in that order. Japan has a vast array of possibilities when it comes to spending the night, and the fact is, not all places are equal. Our approach to choosing accommodation is simple. Traditional Inns are always our first choice. These give you that extra insight into the Japanese way of life and allow you to experience the classic style of accommodation that has greeted Japanese travellers for centuries. One of the great joys of travelling is to fully immerse yourself in the local culture. At first blush modern Japan seems a highly westernised country with western hotels and fast food restaurants. However, if you look beyond the glitter and flash of Tokyo you will find a window into the shadows that are still redolent of ancient Japan. Key amongst these are the Japanese Inns, known as Ryokans, or Minshuku. These are a feature of all of our tours. 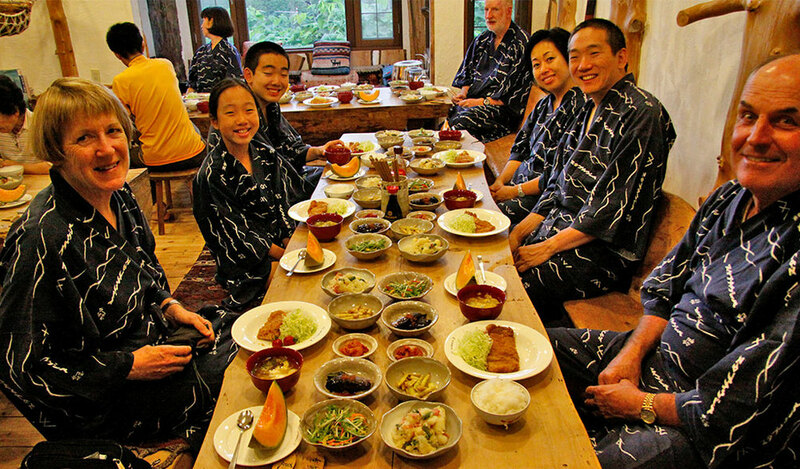 With us you journey into rural Japan and we use a range of accommodations from top class Ryokans to basic Minshukus. Most of the Inns have full Japanese rooms, and some have a combination of both Western and Japanese rooms. Japanese style rooms have tatami, or straw mat floors and futons laid out of a night time. On arrival there is always a hot pot of water and Japanese tea or ocha. You will be provided with a yukata, or kimono style dressing gown to be worn throughout the Inn or lodge. Bathing is ritualised in Japan and the Inns are no exception. Here you can take a long soak, sometimes in hot spring baths or onsens. Several of the locations we use also offer the option of an outside bath or Rotenburo. We try to choose the best quality available in any given location. Sometimes, our best option is a luxury western hotel, while sometimes, in rural areas or small coastal villages, the best or only option may be a small but charming basic inn or pension. LUX - Full luxury Inn – No expense spared, high end appointments, luxury Japanese style rooms (some western rooms optional in some inns in this category) with ensuites, mostly with large hot spring baths, full banquet, some with western breakfast options and full service. QUAL - Quality Inn – High end appointments, quality Japanese style rooms, mostly with ensuites, some with hot spring baths and banquet. TRAD - Traditional Inn – Older style in small villages usually family run with traditional appointments, traditional baths, some with limited bath hours and full meals. Mostly no ensuites. Usually Japanese style breakfast. PEN/MIX - Pension/mixed - Can be family run or small businesses. Some with both western and Japanese style rooms available. Some older buildings. Mostly no ensuites. Some with western breakfast option. Japanese style baths with limited bath hours. WEST/LUX - Western Japanese mixed luxury - 3-4 star style high end western accommodation with quality rooms, ensuites, full service some with Japanese rooms optional and Japanese baths optional. Western breakfasts optional. WEST - Western - Basic western style accommodation with mixed western/Japanese food. With Ensuites. Usually at airports etc. We never use back packer style accommodation. HSB - Aaah, what a great way to end a day in the saddle. Relaxing neck deep in a pool sized bath while the warm thermal water works its magic on your weary muscles. Many of the Inns we use have natural hot spring baths or onsen, and some have rotenburo, that is, an outdoor hot spring bath usually set in a sparkling green forest. Check your trip description for details.